Putnam: All right! All right! This is no need to get crazy. It's very hot. This is a professional matter. 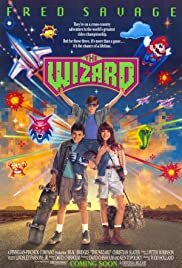 The Wizard is one of the best 80s movies for kids or teens. It's got it all--an excellent and hilarious story, great music, excellent actors, and above all--that little 80s console of long hours of entertainment known as The Nintendo. The Wizard was made to feul sales for Nintendo in promoting it's newest video game, Super Mario Brothers 3, which I understand to be the company's best selling game of all time (and with good reason). The story involves three kids, struggling for independence from their messed up family life. Fred Savage plays Cory, who's father and brother tend to change the subject of the uncomfortable fact that his half-brother Jimmy is going to be put in a foster home. Not if Cory can help it. He and Jimmy go Shanghai for California, the land of possibility. Along the way, they meet Haley, a hot shot young girl who's father is a truck driver and mother is a gambling addict. On her way to Reno, she discovers that Jimmy is a video game wizard (like the Pinball Wizard). With the Video Game Armaggeddon just weeks away, Haley comes up with the idea that the three kids should pool their resources, go to California, compete, and split the cash. It may seem like an easy goal--heading from Utah to California on a skateboard and a couple of bucks, hustling video game hacks along the way. But meanwhile, a crazy bounty hunter kind of guy has been hired to bring Jimmy (and only Jimmy) back home. He's similarly in a competition--against Corey's father, who needs to get to the kids first before the crazy bounty hunter does. This movie has it all. You get to see some the greatest Nintendo games (Double Dragon, Teenage Mutant Ninja Turtles) The Adventures of Zelda, Excite Bike, and Rad Racer) in addition to other Nintendo accessories such as The Power Glove ("I love the Power Glove, it's so bad.") It's so effective in selling Nintendo nostalgia (though it wasn't quite nostalgia when the movie was made), that it will make you want to pull out the old console--or emulator--and have a crack or two at some games again. Additionally, you have an excellent cast of actors involved in a hilarious cat-and-mouse chase, with the most laughs coming from the traveling dispute of the bounty hunter and Corey's dad (Beau Bridges). Plus, how can you go wrong with an early Fred Savage, Jennifer "Rilo Kiley" Lewis, and Christian Slater movie? You can't. It's packed to the brim with excellent features that if you're in love with the 80s, you're sure to enjoy.